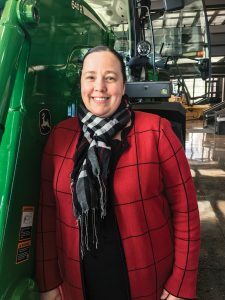 Elizabeth Conzo-Kershner, who graduated from Wright State with a bachelor’s degree in economics, leads analytics in precision agriculture at John Deere. Growing up on a dairy farm in central Ohio, Elizabeth Conzo-Kershner ’00 had to be an early riser to get her chores done. That hasn’t changed much. Even today, the Wright State University alumna is in her office in Des Moines, Iowa, by 6 a.m. The difference is that Conzo-Kershner now leads analytics in precision agriculture at John Deere, a Fortune 500 company with a rich history that manufactures agricultural, construction, and forestry machinery; diesel engines, axles, transmissions, and gearboxes used in heavy equipment; and lawn care equipment. Conzo-Kershner’s diverse team of data scientists, engineers, and agronomists develop solutions and insights to improve outcomes for the business, John Deere dealers, and ultimately farmers. Precision agriculture is a farm management concept based on observing, measuring, and responding to field variability in the growing of crops, often through the use of satellites or drones. Sensors measure moisture and nitrogen levels to seed and spray at the exact levels needed to maximize yields and preserve resources. After her early-morning arrival, Conzo-Kershner usually spends much of her day listening to project updates or giving updates to leadership. Currently, she has 14 direct reports, so she spends a lot of time in one-on-one meetings to understand progress and provide input on various projects. The most challenging and exciting part of her job is working to keep up with technology, an ever-changing landscape. Conzo-Kershner has been working in or leading analytics teams at John Deere for 15 years in manufacturing and sales marketing. 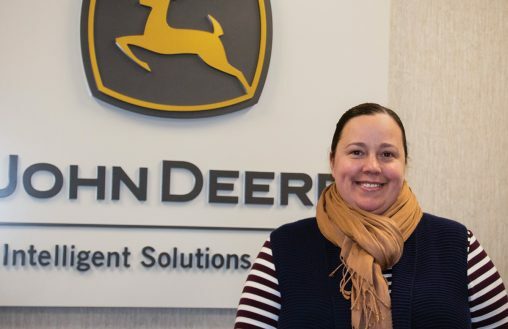 She helped develop and inject predictive modeling into Deere’s sales and operations planning process and led the establishment of processes and models to support inventory optimization. Conzo-Kershner grew up in Marysville, Ohio, graduating from Fairbanks High School in 1997. She enrolled at Wright State after receiving a full valedictorian/salutatorian scholarship to study applied economics. Along the way, she was active in campus leadership, serving as president of Student Government and treasurer of the Zeta Tau Alpha sorority. She was also a member of the economics club and Model UN. Conzo-Kershner is especially remembered during her time with Student Government for spearheading and starting a program for Student Government leadership within Ohio to provide members the opportunity to share ideas and network with other student government leaders across the state. Her idea sparked the Ohio Student Government Summit, as a part of the Ohio Student Government Association. Conzo-Kershner also had a very heavy hand in getting a Student Government scholarship established when she was a student and helping to get it endowed in 2018. On a more personal level, she has established a scholarship named in the memory of her late brother, Jacob Repasky, who passed away before finishing his college career. The scholarship provides financial support to students who are engaged in extracurricular activities while pursuing business and economics degrees, but particularly for female students. Her initial intention with the scholarship, she said, was to also encourage more leadership opportunities and advancement for women in economics. After graduating with her bachelor’s degree in economics in 2000, Conzo-Kershner went to Washington, D.C., where she worked as an economist in the U.S. Department of Commerce. She later returned to the Midwest, where she worked for four years as an assistant director in the Fisher College of Business at The Ohio State University. Conzo-Kershner’s passion at that time was econometric forecasting, so she began looking for jobs with companies that were applying that in their core processes. That led her to a position at John Deere, which was seeking an entry-level forecaster. Over the next 15 years, Conzo-Kershner was given the opportunity at John Deere to apply her passion for analytics across multiple functions and around the world. She has held nine different roles in three states and two countries, and spent a year living in China leading John Deere’s order fulfillment processes in multiple factories. Conzo-Kershner has words of wisdom for students, especially women, seeking leadership positions in the corporate world.